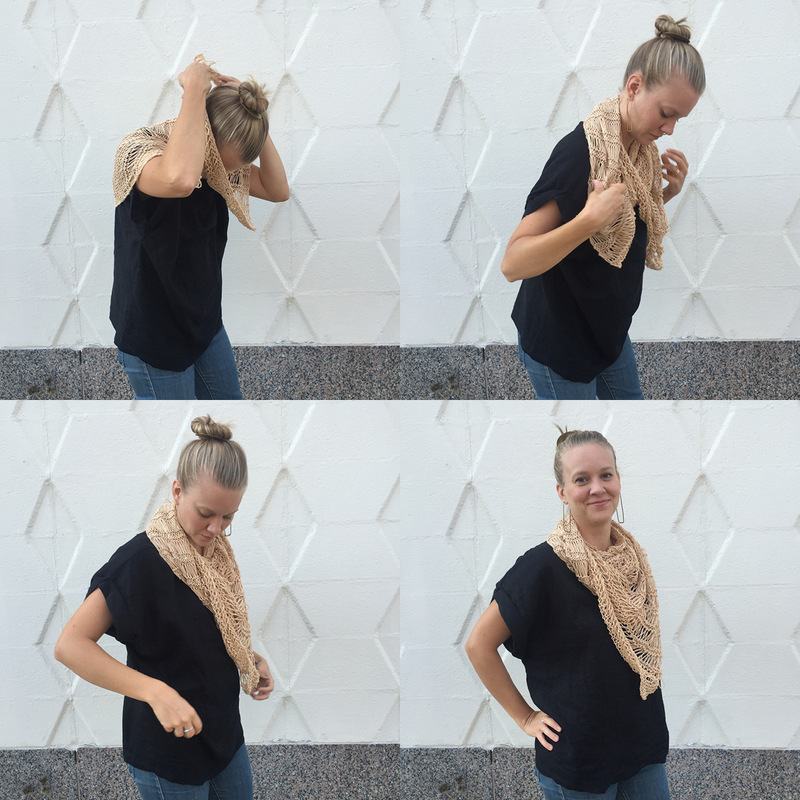 Tis’ the scarf season! I am totally obsessed with scarves. Any time style and comfort cross paths I’m there. Birkenstocks: check, Yoga pants (style, trend, whatever): check, oversized knit sweaters: duh. You can never have too many scarves, and when you come across one that is soft, stylish AND hand-made with love- you just can’t go wrong. 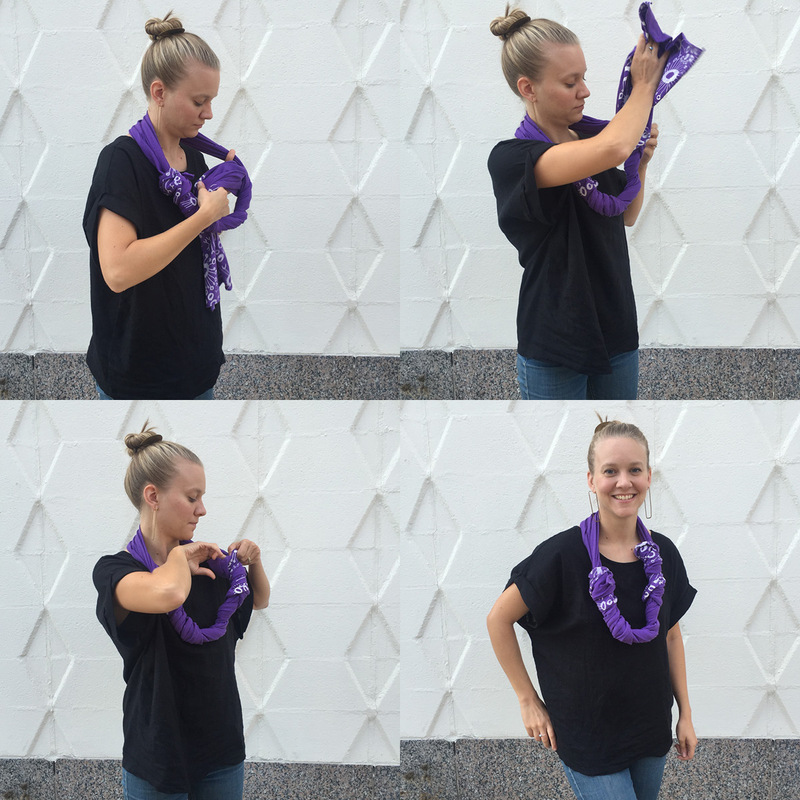 On this edition of How-To, imma show you how to tie some of the scarves we carry. From basic to unique, there are so many options and these are just a few. Get ready for a whole bunch of pictures of yours truly. 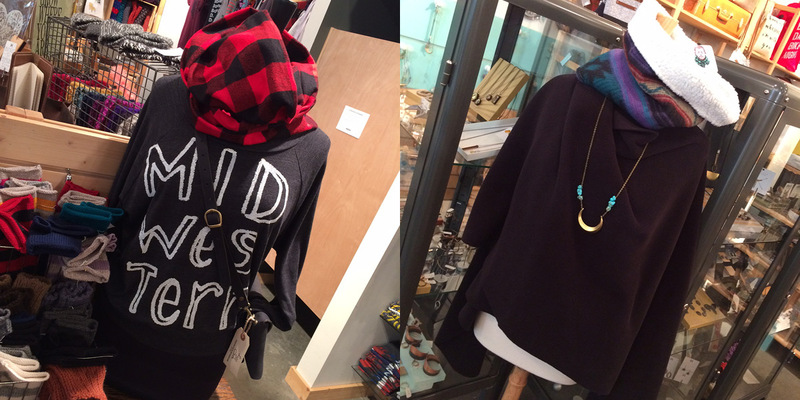 So when that mood strikes you, and you’ve just got to get cozy, come browse our selection of scarves. We’ve got just the thing. 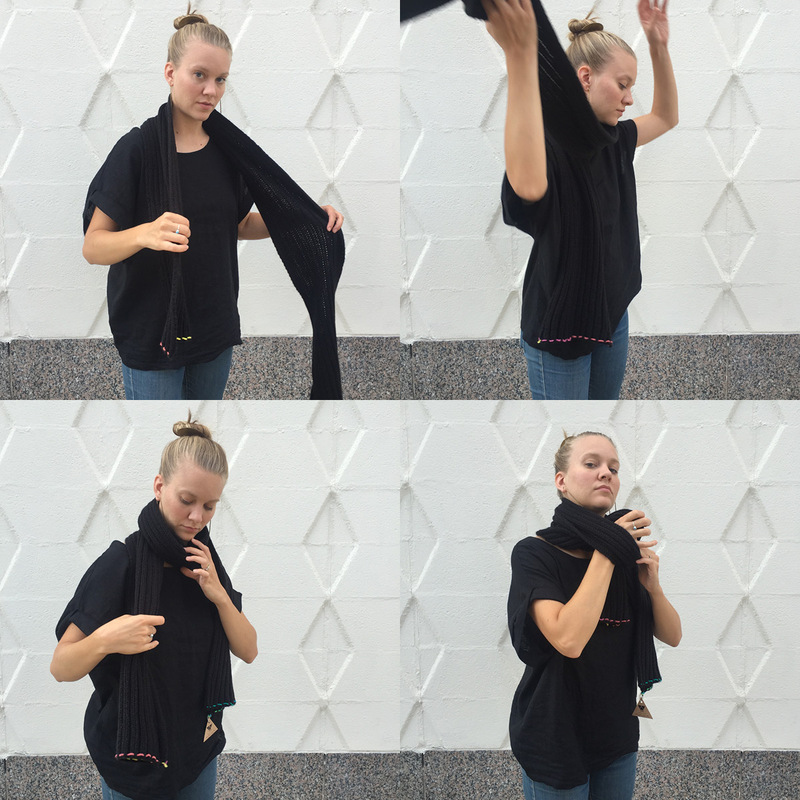 This scarf is a wide rectangle shape. 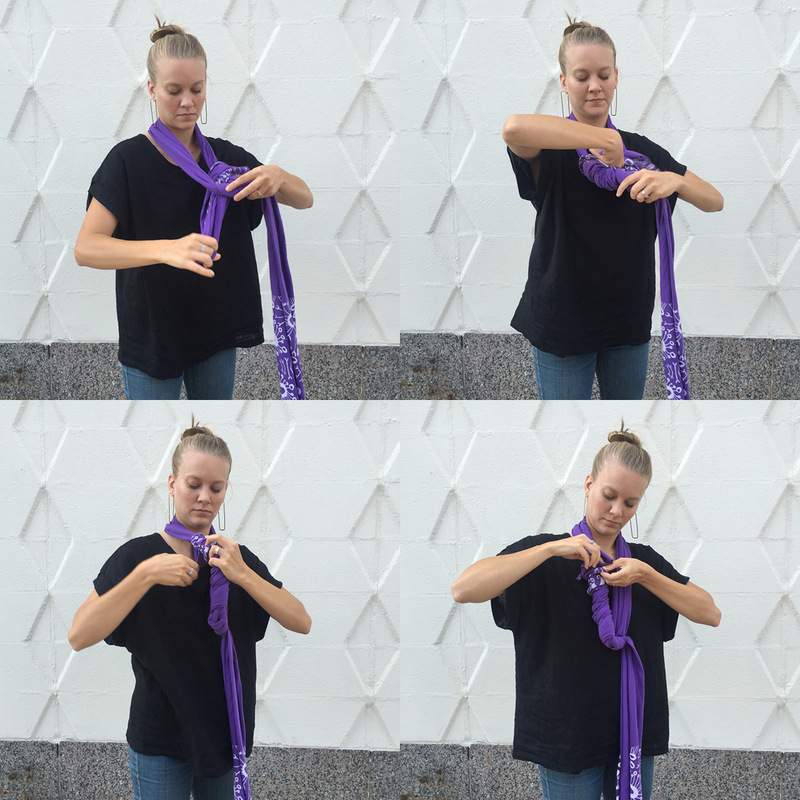 I wasn’t sure how to tie it at first- but turns out you can just make any scarf into an infinity scarf by tying two corners, then twisting once or twice around like you would a full circle. I love this look. 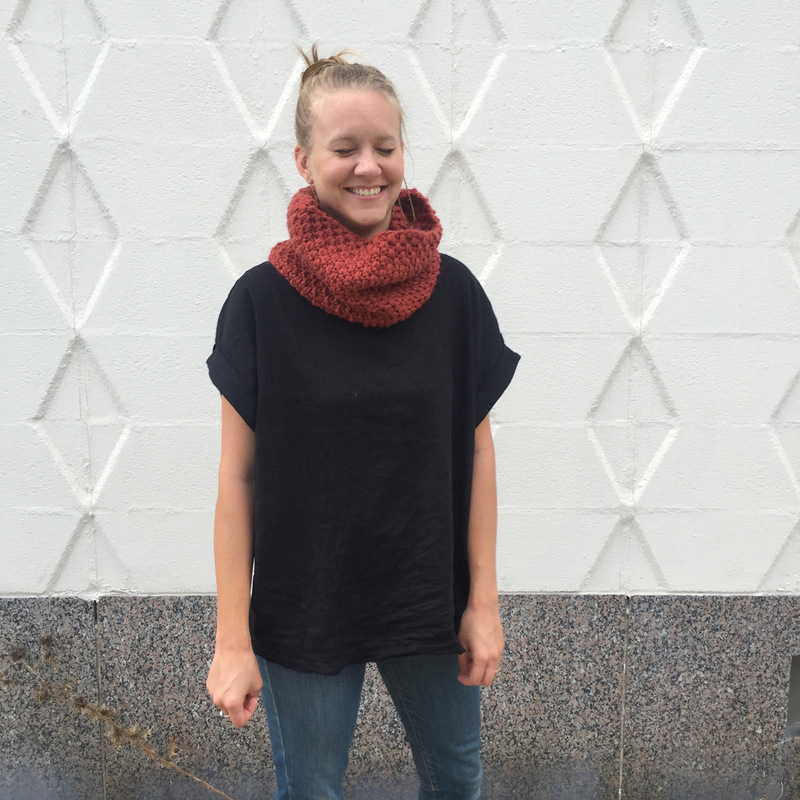 Bonus: this scarf by Kitty Knits is my favorite scarf in the shop. 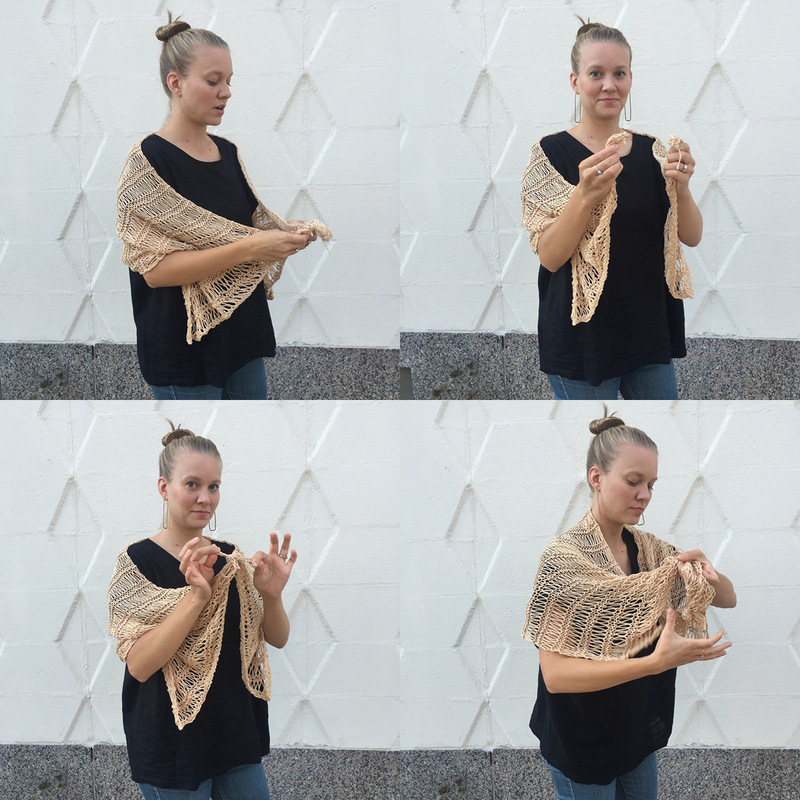 It works beautifully as a shawl, too. 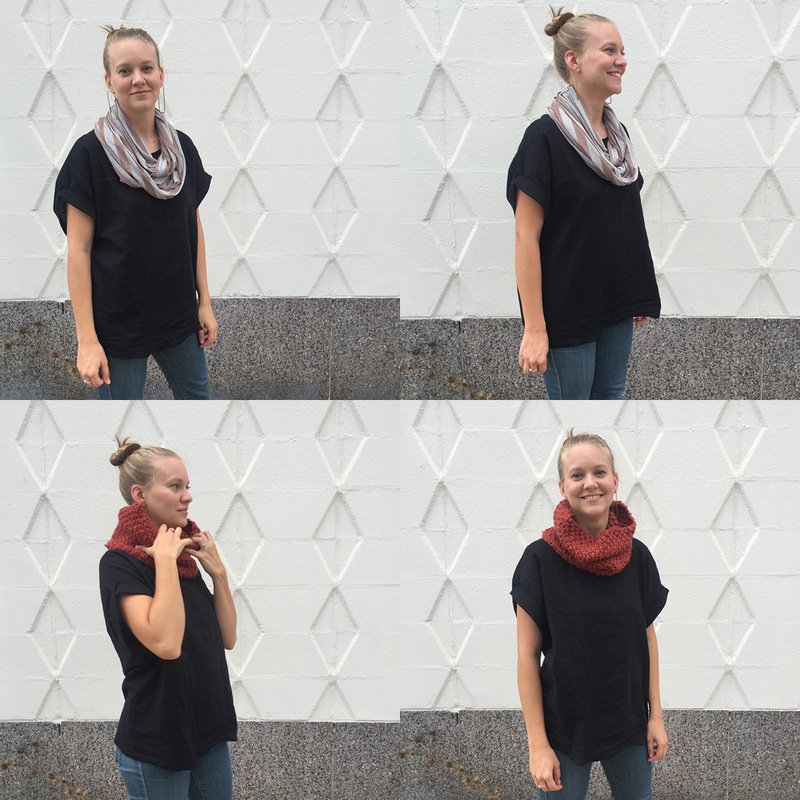 This is perfect for long, skinny scarves. 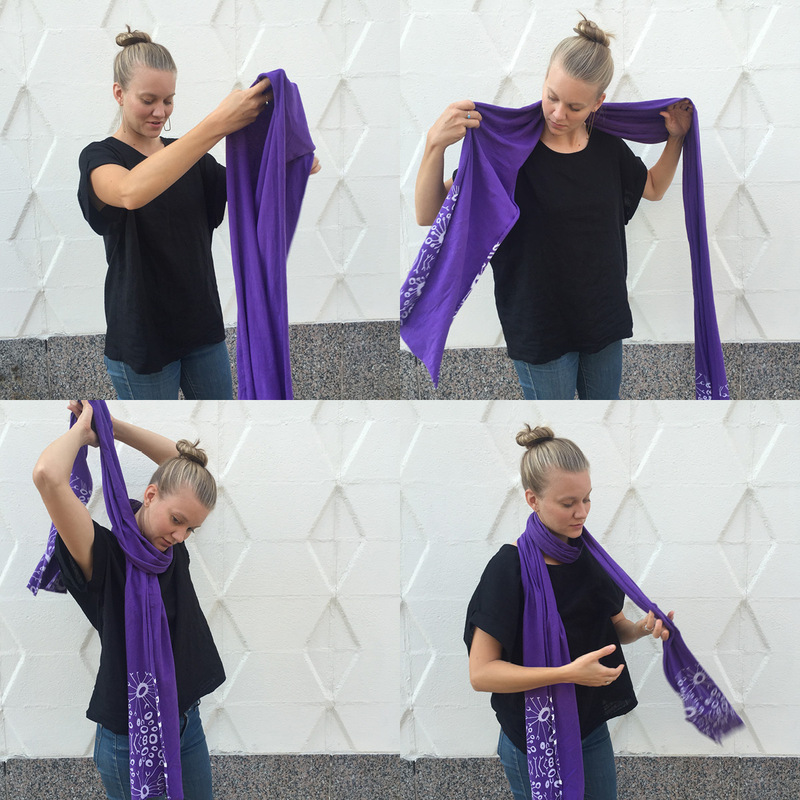 Start with the scarf behind your neck, leaving more on one side than the other. 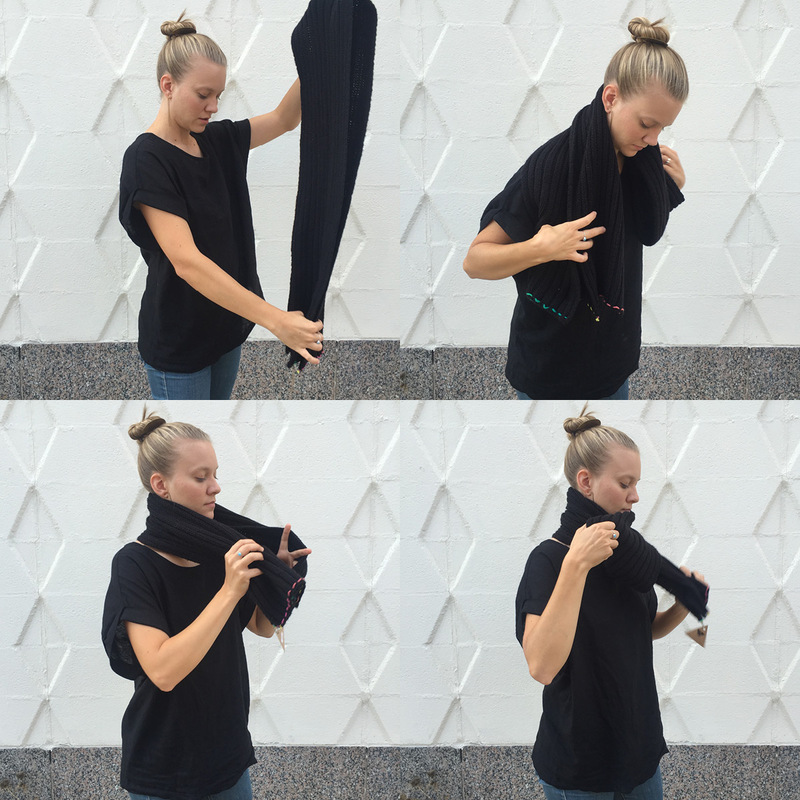 Wrap the long side around your neck twice. 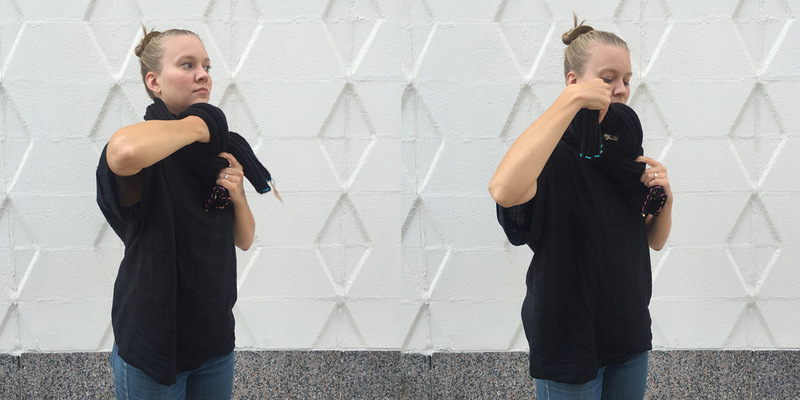 Grab the two ends and tie a granny knot, “floof” and ta-da! This one is so EASY and unique! Get equal lengths on either side of your neck, and tie a granny knot roughly as low as you’d like the finished necklace to be. Twist each side back up around itself, and tuck in the little ends. 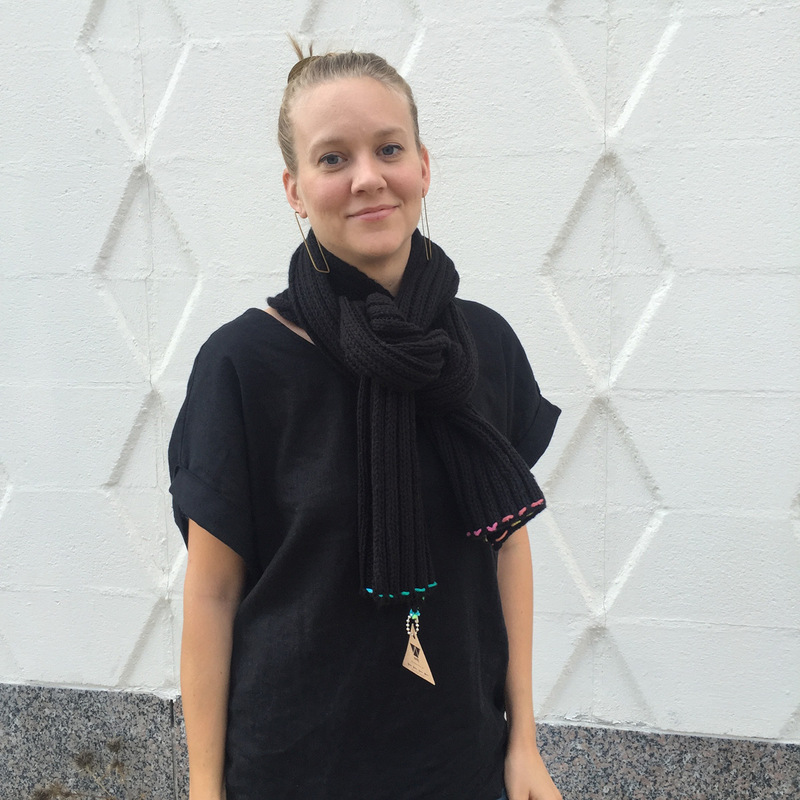 Our Megan Lee Designs scarves are perfect for this one with lots of different colors and patterns to choose from. So this one is pretty straight forward, but I felt I would be remiss if I didn’t include it! 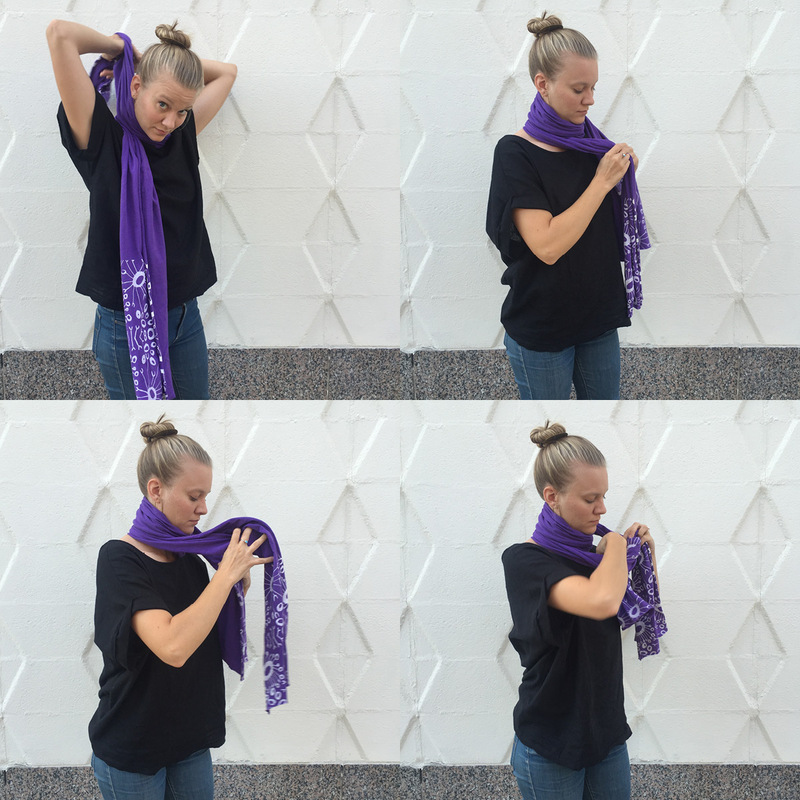 Fold your scarf in half, wrap it around your neck, and pull the ends through the loop. 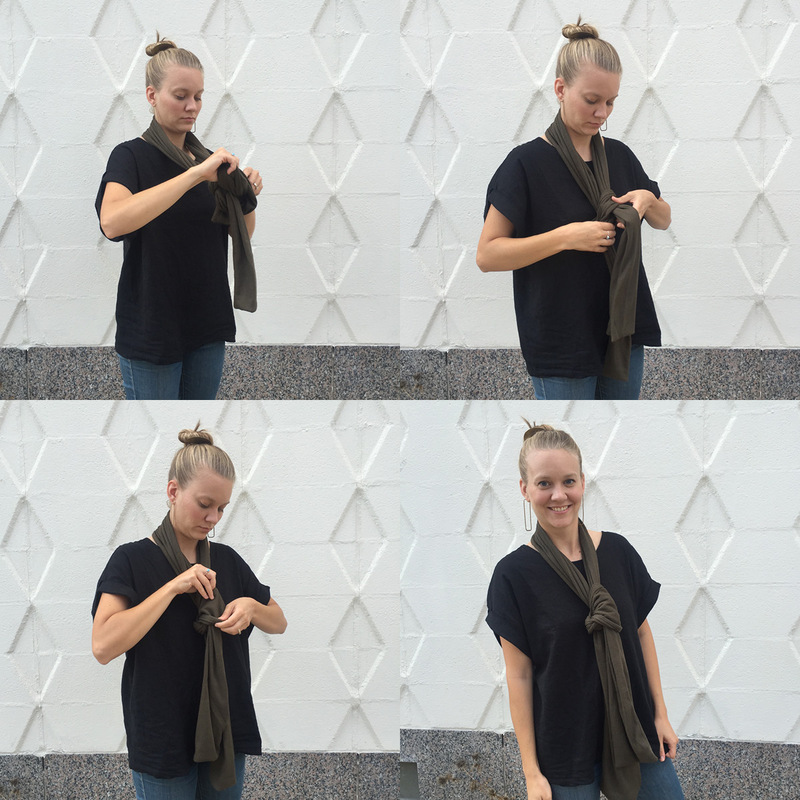 Our Woodly scarves are perfect for bundling up with this tie. So this is definitely the trickiest of all the knots I have to show you today, but it has a pretty stunning result. Once again, hold the scarf behind you so there is more length on one side than the other. Wrap the long side around once, then pull the short side through to form a loop. Push the end of what used to be the long side through that loop, and floof. Not so hard. Aw, yeah. Look at that jaunty finish pose! This tie is so stylish. 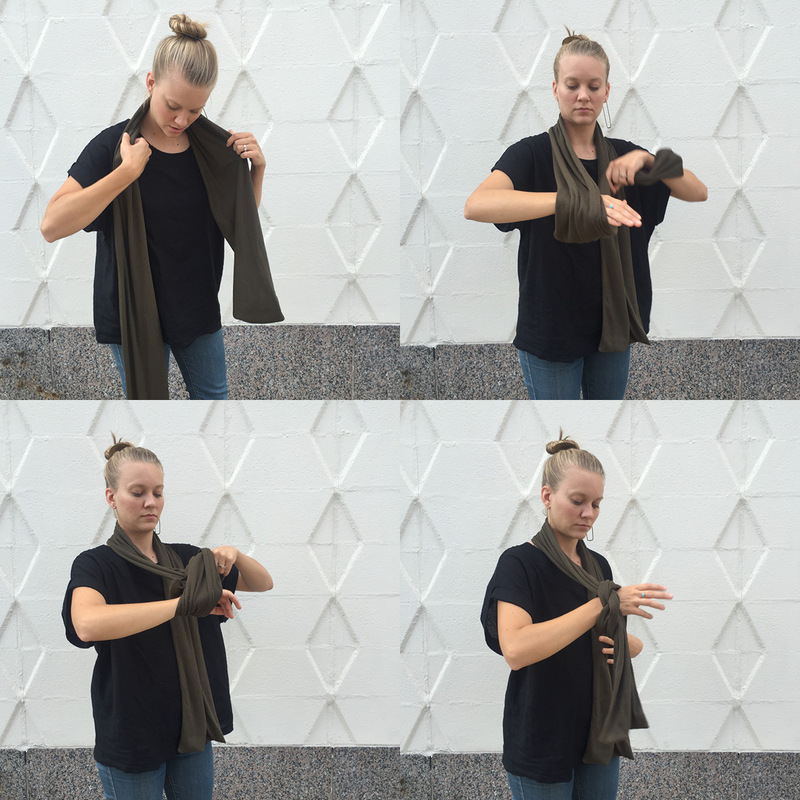 Tie a granny knot around one of your wrists with one side of the scarf, then pull the other side through. Do some floofing and your done. 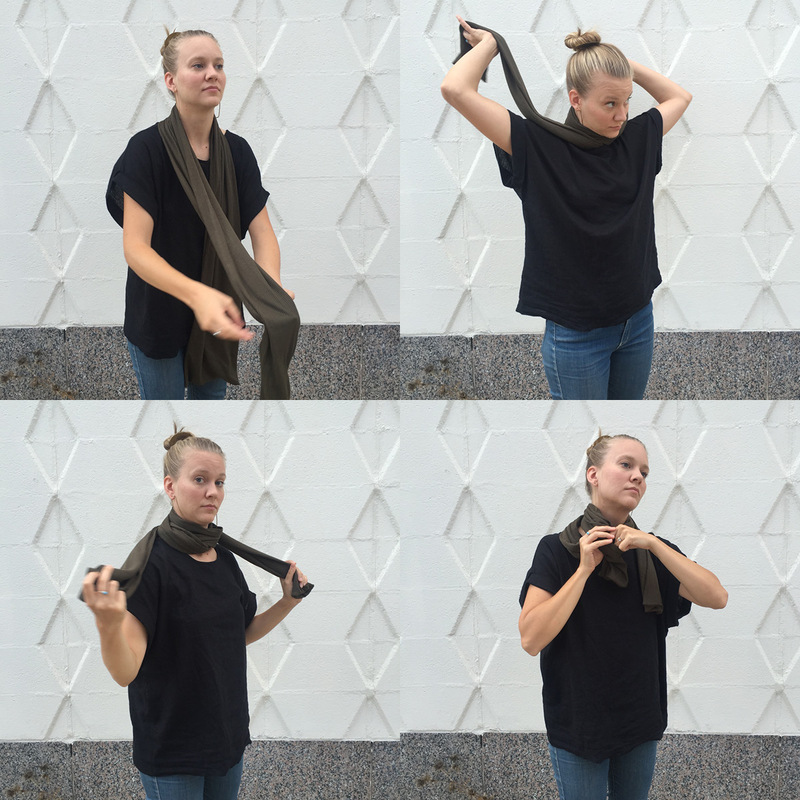 Also known as the “neck tie,” this silky smooth scarf by Just Liv is just the ticket. So classy. 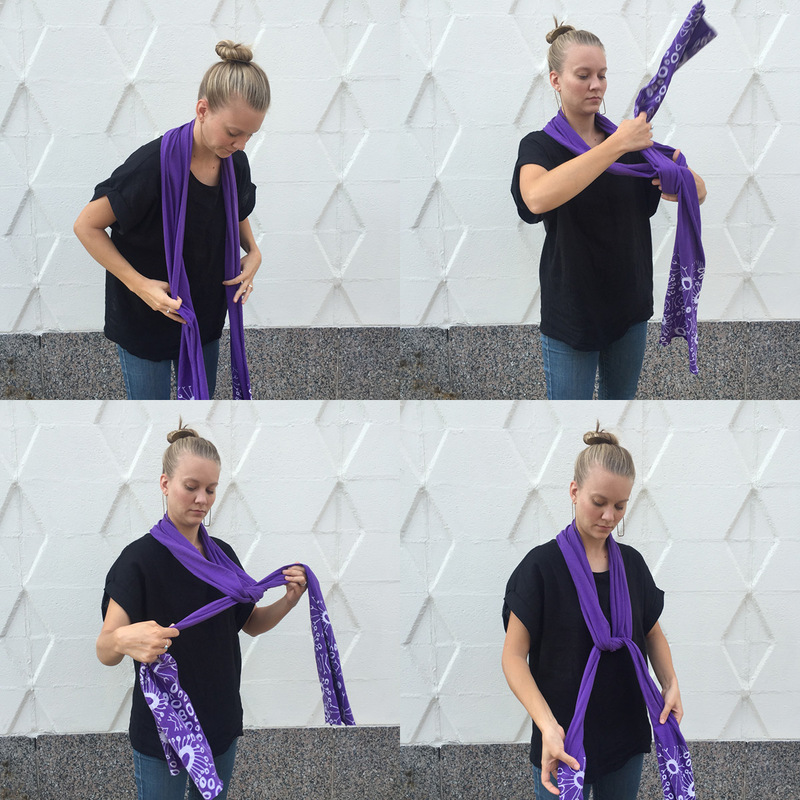 Cross ends of the scarf back and forth around your neck twice, then pull up the ends through one of the loops. Perfect. 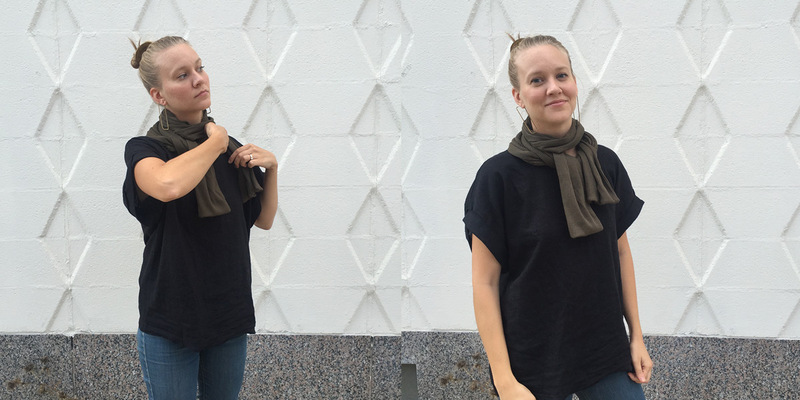 So maybe you’re just not ready to commit to tying a scarf every time you want to wear it. Maybe you’re not the directions-reading type. MAYBE YOU JUST LIKE A GOOD COWL. Well, you’re in luck. Here we have just a selection of what’s available for the once-and-done scarf wearer. Now you’re ready! 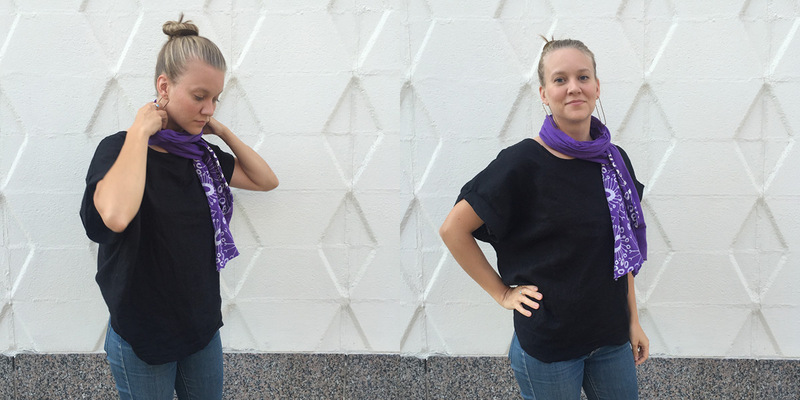 Ready to look good every day of the season because scarves are awesome like that. Also- P.S.- the awesome hair fork I’m wearing is by kFroet and we have that in the shop too. It’s my 2nd favorite fall accessory (after scarves). Check your calendar, it’s calendar season! 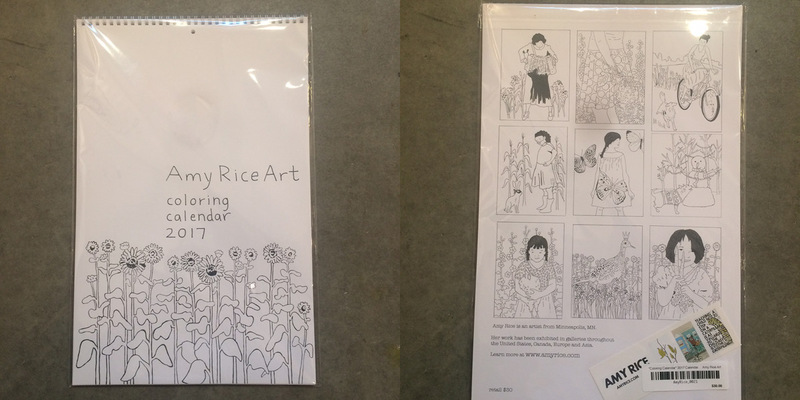 And if your calendar didn’t make you smile every month this year, it’s time you came down to Homespun and perused our selection. We’ve got lots to show you today, and many more to come. New from local designers TF Publishing. Included: monthly color therapy time. From Amy Rice Art. Insta-costume for just $25 bucks. 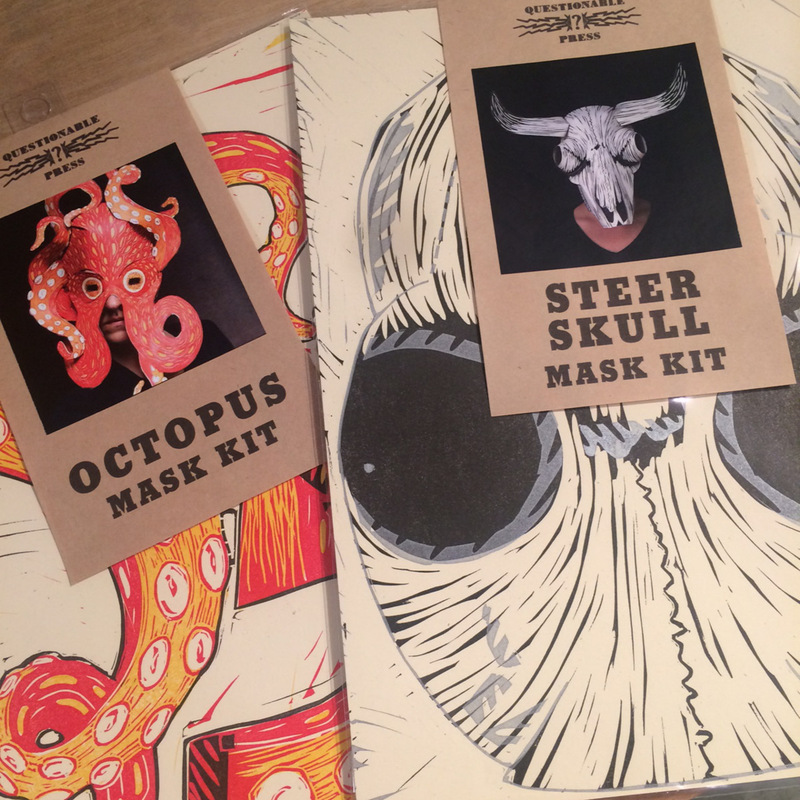 Get one of these eye popping and beautifully crafted paper masks from Questionable Press. Lots of critters to choose from. 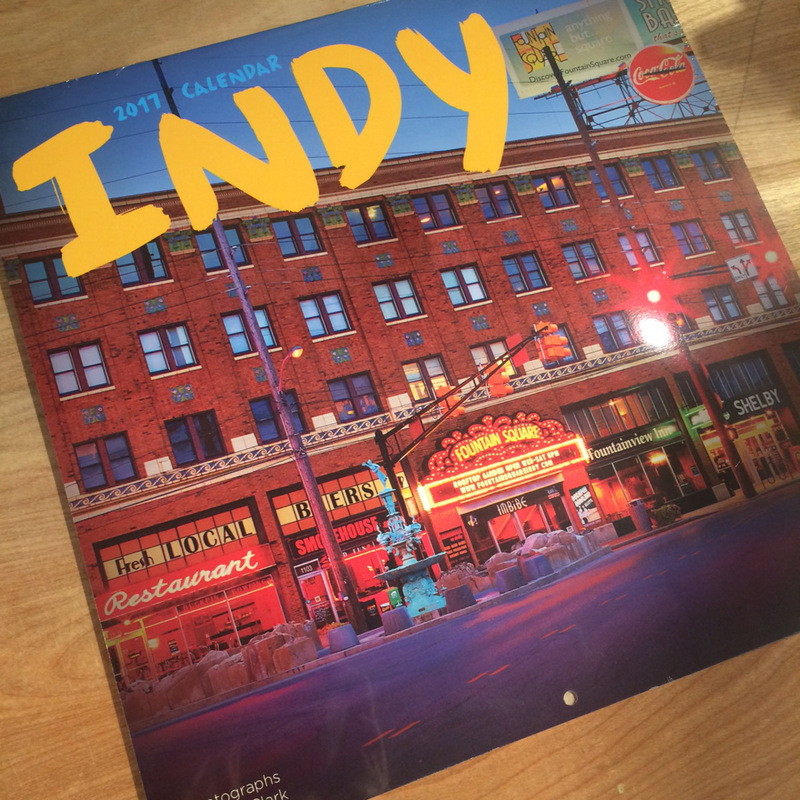 Color Me Indy coloring book by Grant Thomas. 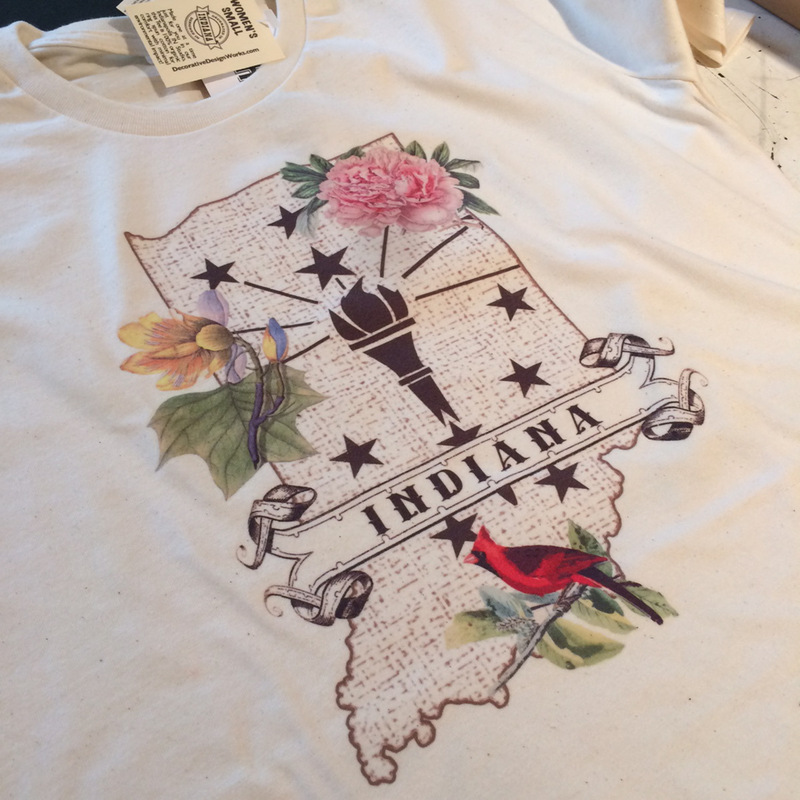 Shiny Indiana tee by Decorative Design Works. Pretty little spoons and matching trinket dishes restocked from Sarahmics. I don’t even know if these are new but these magnet sets from Exit343 are too awesome not to post. 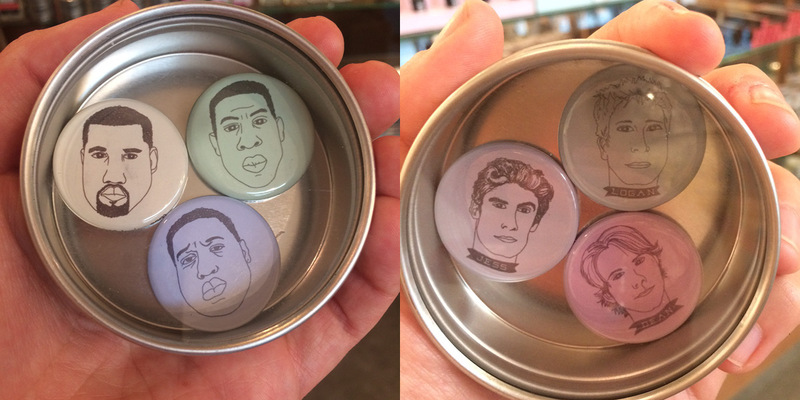 Rappers and the boys from Gilmore Girls (except we need a Luke!). 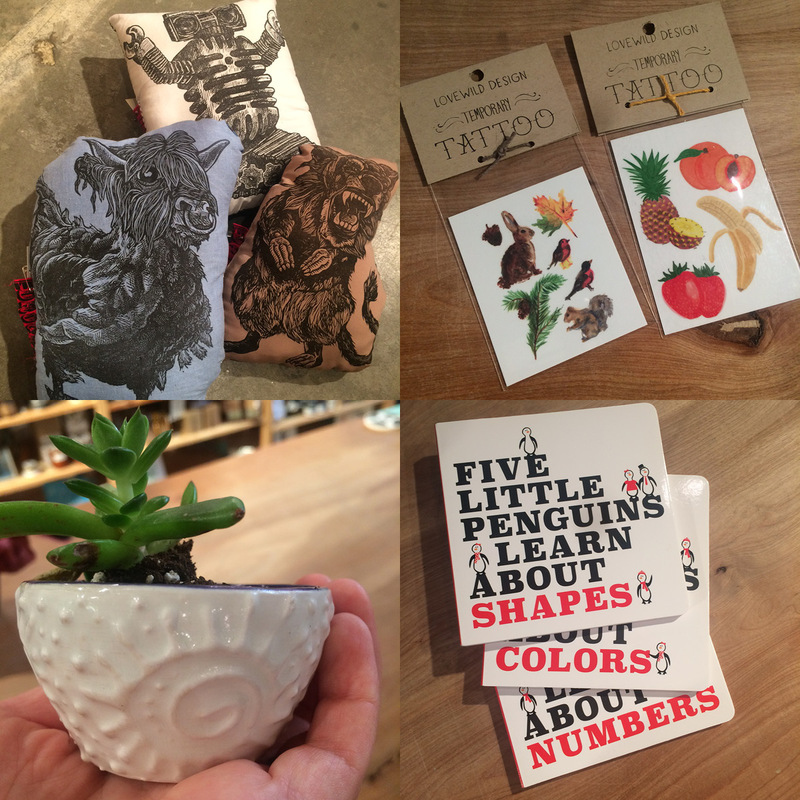 Creepy creatures on pillows from DRock Press, temporary tattoos by Lovewild Design, the most adorable little penguin books by Yellow Door Publishing, designed and printed in the USA, and these cute little dishes/ planters are the best! By Sunflower Studios. 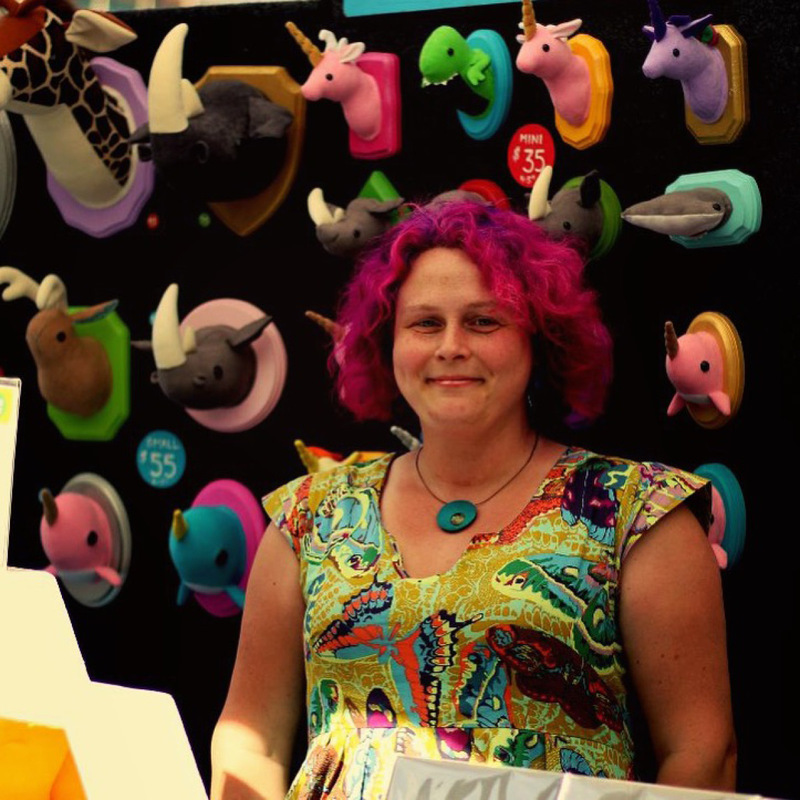 This is Jen Gubicza, maker behind the Zooguu menagerie. 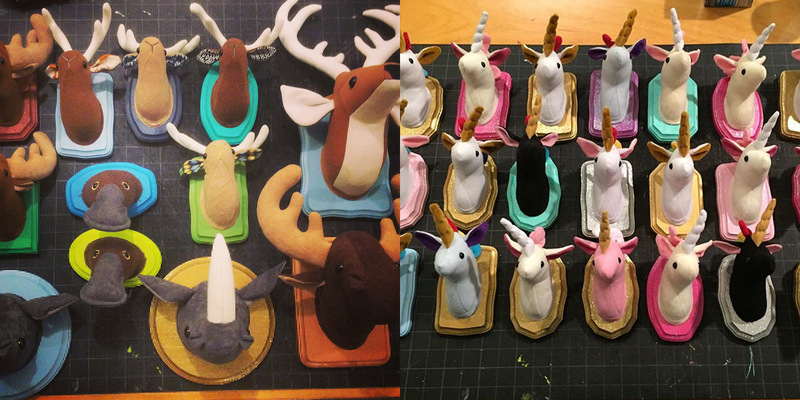 She designs all the patterns and does all the sewing to bring to life each of these unique and surprisingly cheerful plushies. 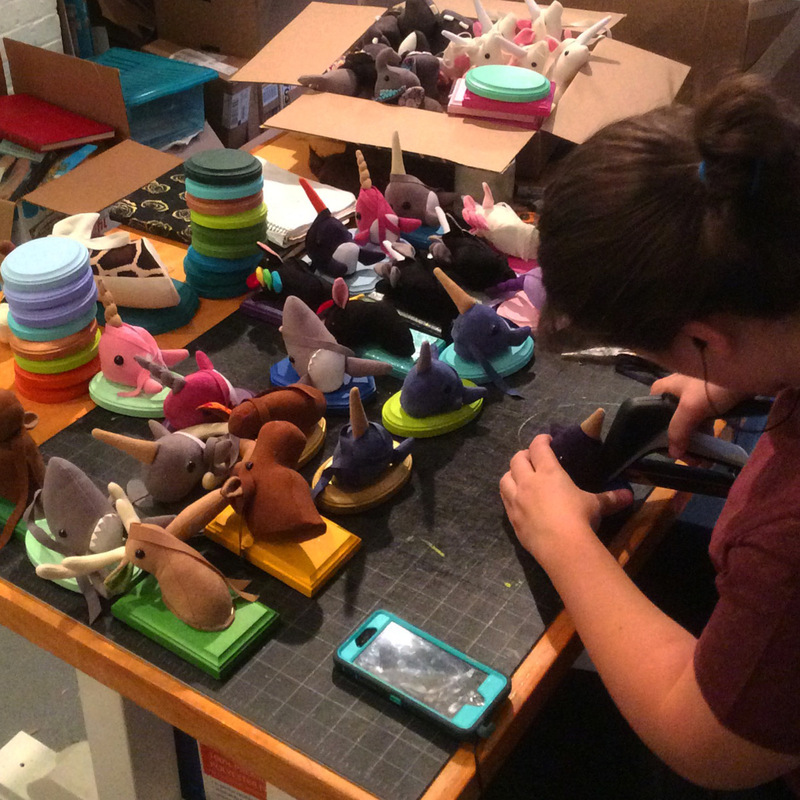 This line of roly-poly dinosaurs and animals are brightly colored and expertly crafted. They are the perfect toy for the child in your life. 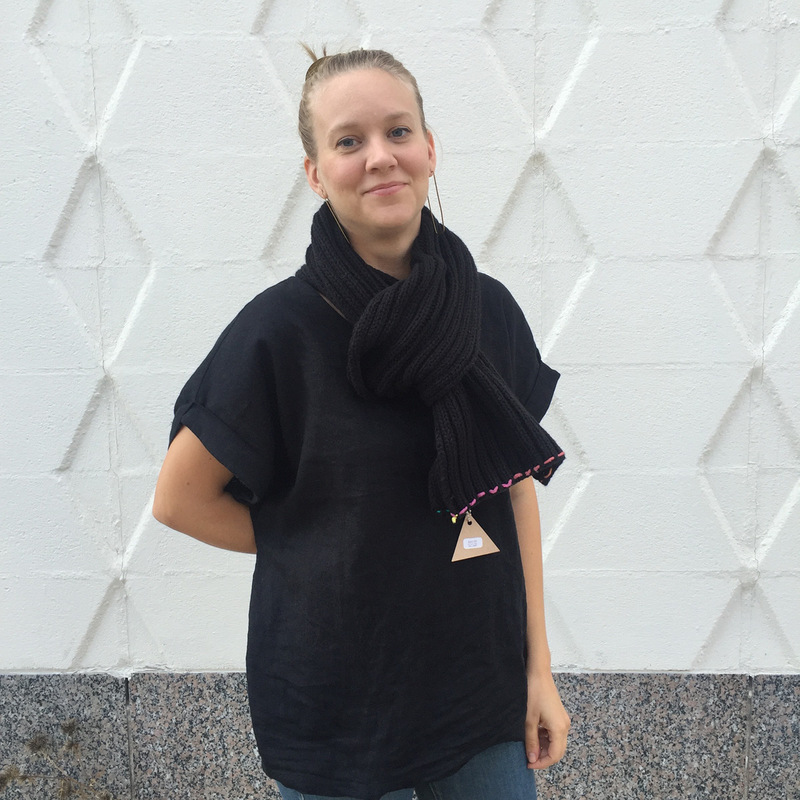 Learn more about Jen and her passion on this edition of Meet Your Maker. I always describe myself as a maker of things. 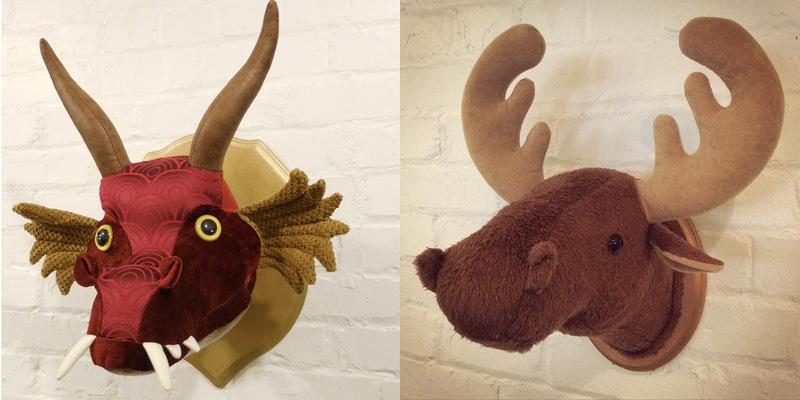 I make toys & faux taxidermy home decor. I talk about how I design the sewing patterns & everything starts from scratch with raw materials: fabric, thread, fiberfill & wood. I’ve always had a passion for making things. It’s really not even a choice at this point. I even have a bag filled with some portable sewing project these days that I carry around everywhere. I love that I get to create things that I would like to see out there in the world. 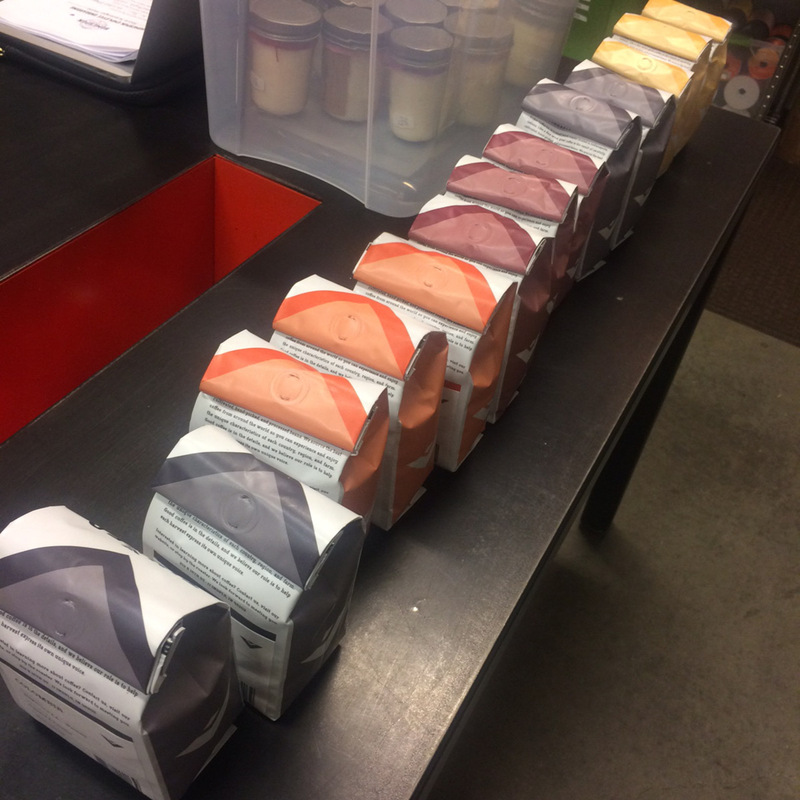 There’s freedom in being able to design a new product on the fly and test it out immediately. I wouldn’t want to be doing anything else. I have always wanted to be a working artist. 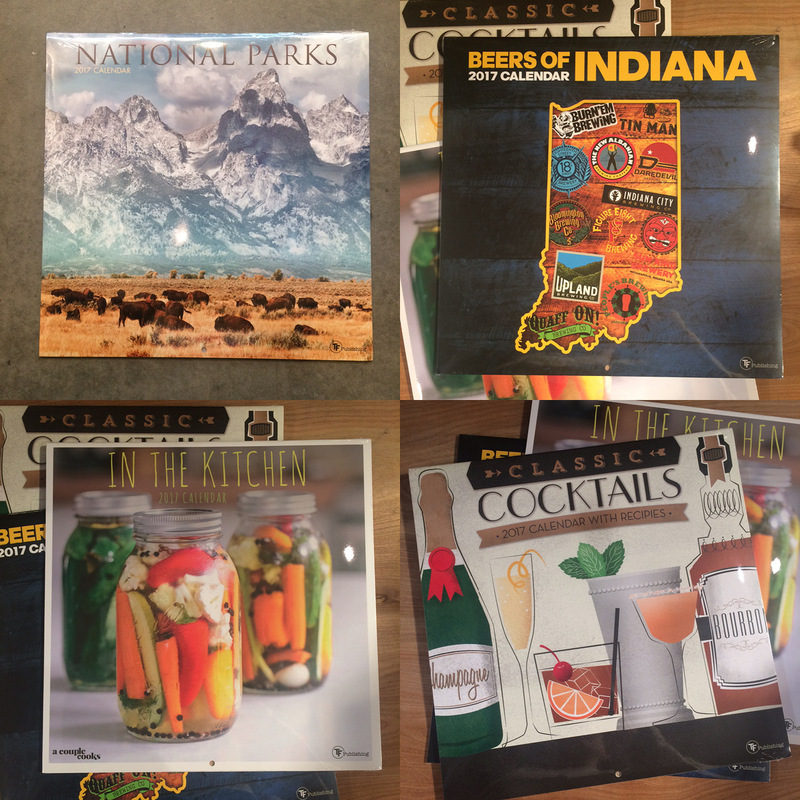 Before I was a full time maker, I was a full time graphic designer, and I went to college for design. I currently rent studio space on the lovely island of Nahant, MA. I typically arrive in the morning and work until I get tired, take a break for lunch, work some more, take a break for dinner, and then go home. I have an assistant that comes to the studio a few times a week and that help is invaluable. The great part about being a working artist is the flexibility I have. If there’s an event I want to go to, or I’m teaching a class one evening, I can plan for that and take time off when I need to. 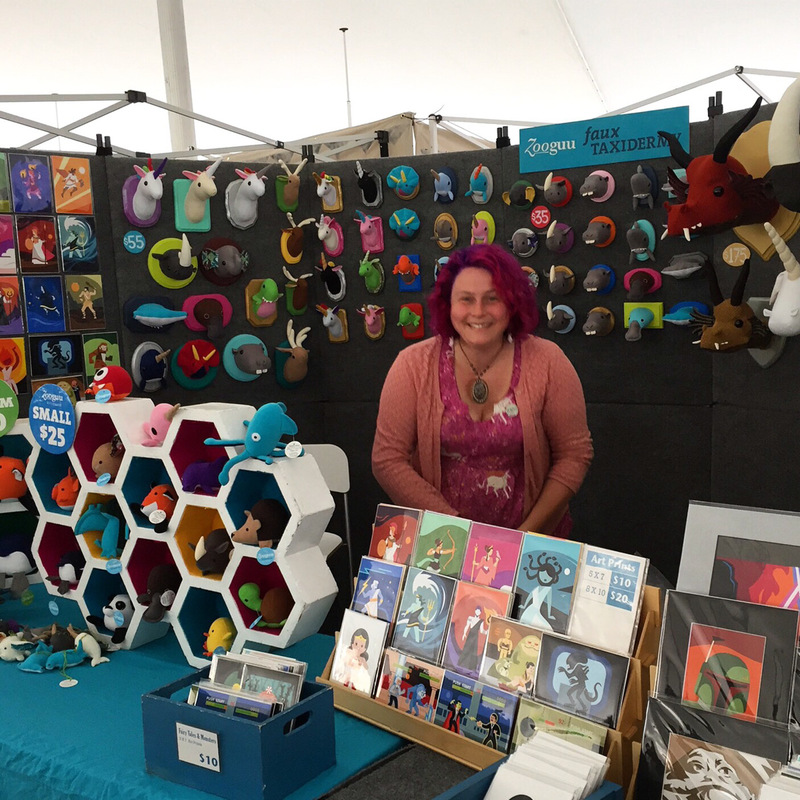 I also get to do a lot of traveling for craft shows, which is nice. 6| How often do you add a new creature to your collection? I’m adding new things all of the time. Not all of them make it to the website as often as I’d like, but since I do markets every weekend I’m always adding new things. 7| How do you choose your fabrics? Fabrics are chosen for durability, washability & color selection. 8| Do you have best seller? 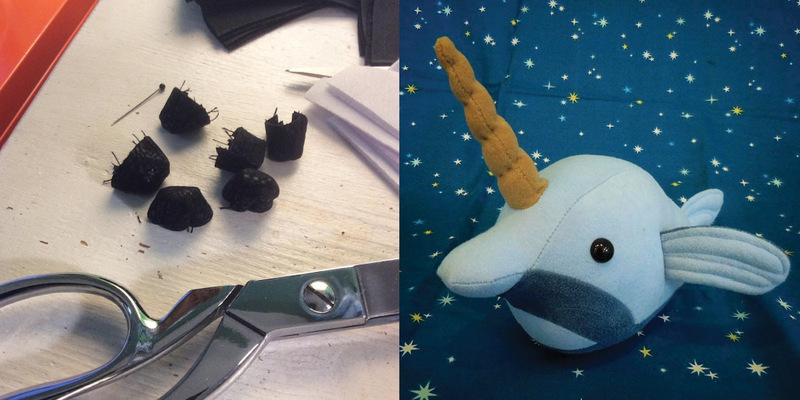 Narwhals, dinosaurs & unicorns are all top sellers. Handmade objects are unique, high quality, and you can see the artist’s hand in the work. That’s a tough question. 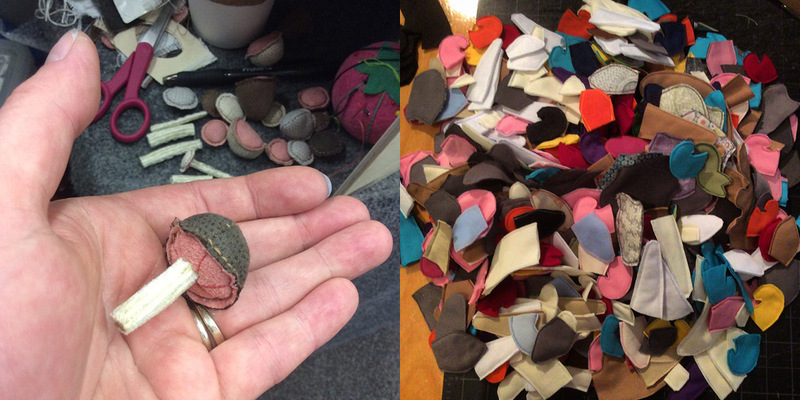 I try to fill my life with handmade objects that all inspire me every day. Probably an original painting by Jonathan Reincke. His skill and color sense are gorgeous. I was an all star field hockey goalie in high school & I turned down a college athletic scholarship to go to art school. I love visiting with animals. I love drinking whiskey with friends. Pop into Homespun if you’ve got to have one of these cuties, and check out Zooguu online, on Facebook, Twitter, and Instagram! Thanks Jen! We’re over here soaking in the beautiful autumn sunlight while admiring the new handmade items that come through our door every day. Take a look and don’t forget to experience them in person- the feels and the smells are just as good. 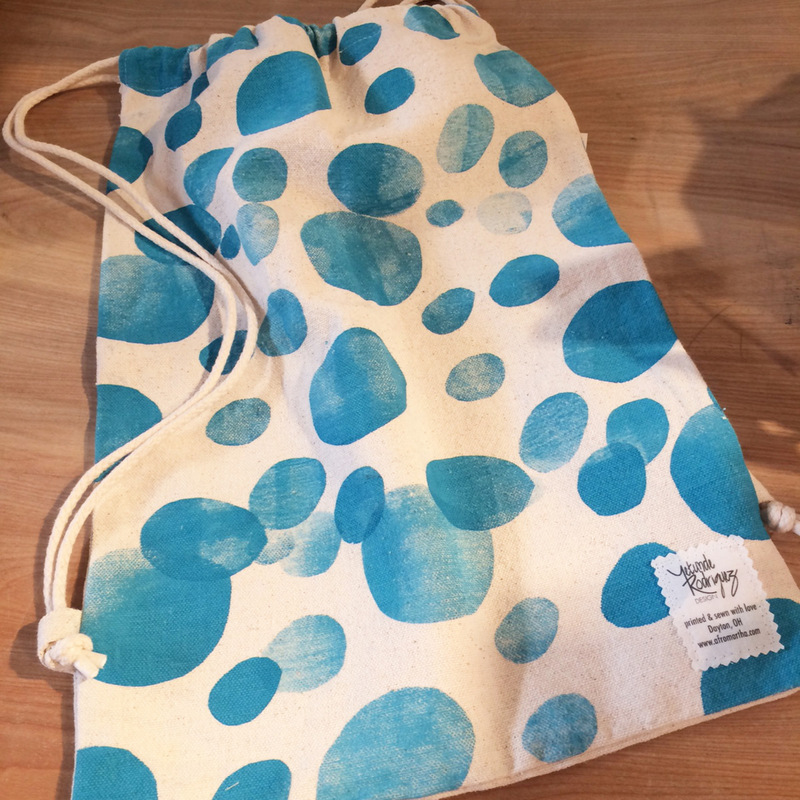 New vendor Yentunde Rodriguez Design brings us these beautiful patterns, block printed on soft linen fabric. I also just had to throw in this unique item from 407 Botanicals. A face mask sounds so luxurious right now! 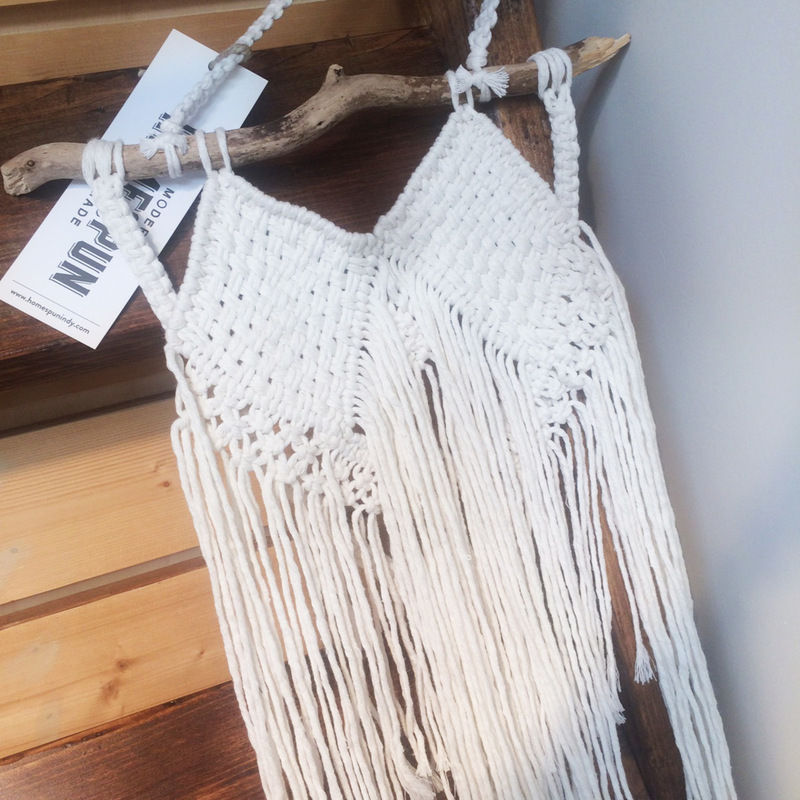 We have some beautiful new macrame pieces in from artist Savannah Norris and we are all stocked up with Frittle. And- it’s leg warmer season. 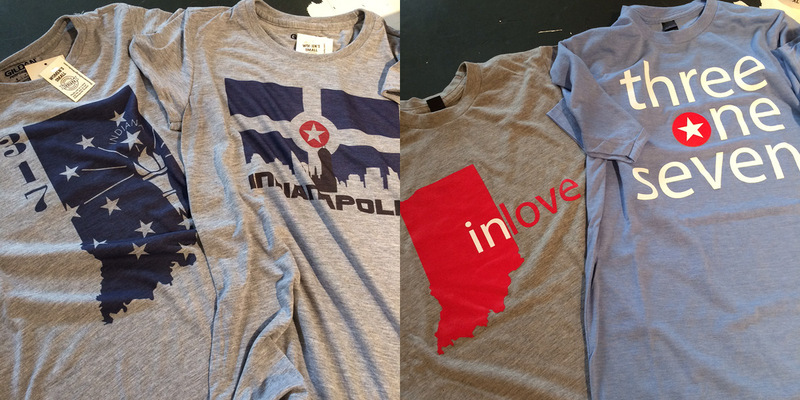 We have so many cute designs on the shelves from Nicole’s Threads. This cute little bug caught my eye today- a little ceramic bud vase from Linnea Campbell Ceramic Art. 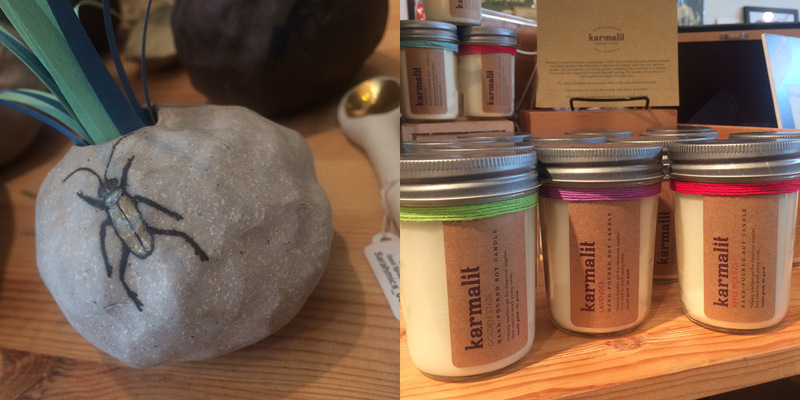 Also, we’ve got a bunch of new candles from Karmalit and they seriously smell amazing. Plus a percentage of their sales help fund classroom needs – helping teachers and their students. The perfect excuse to buy more than one. 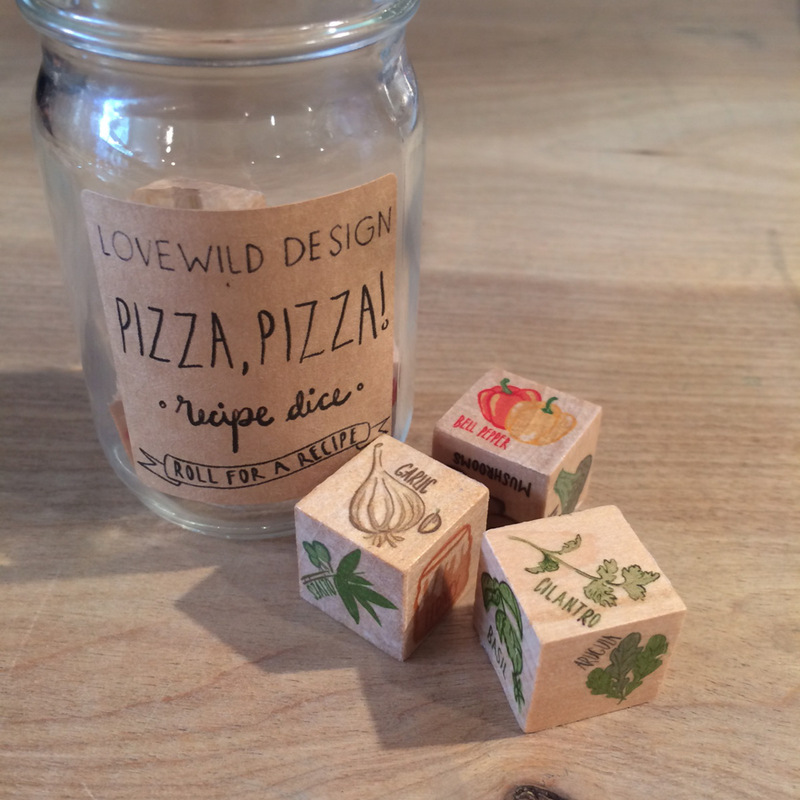 Wait until you see all the awesome things we got from Lovewild Design! 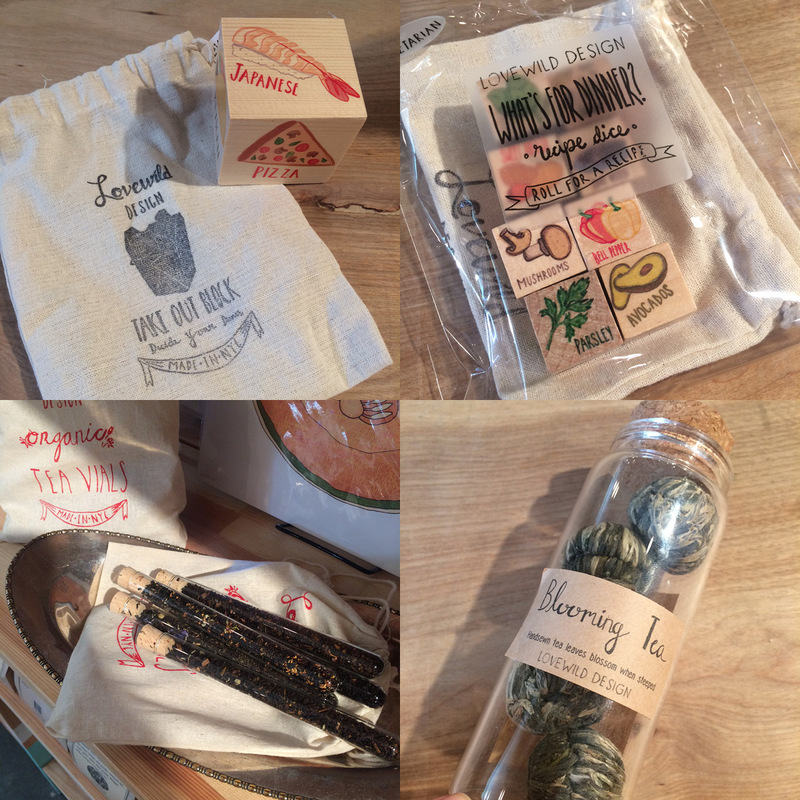 The most brilliant decision making dice, amazing organic teas and more. 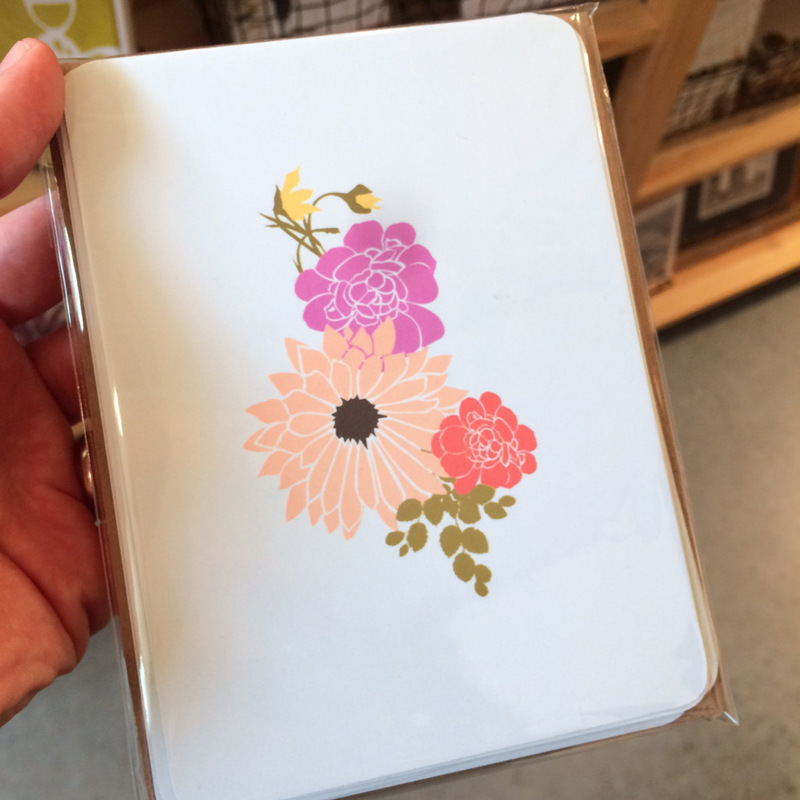 Fun, useful, and beautifully packaged! 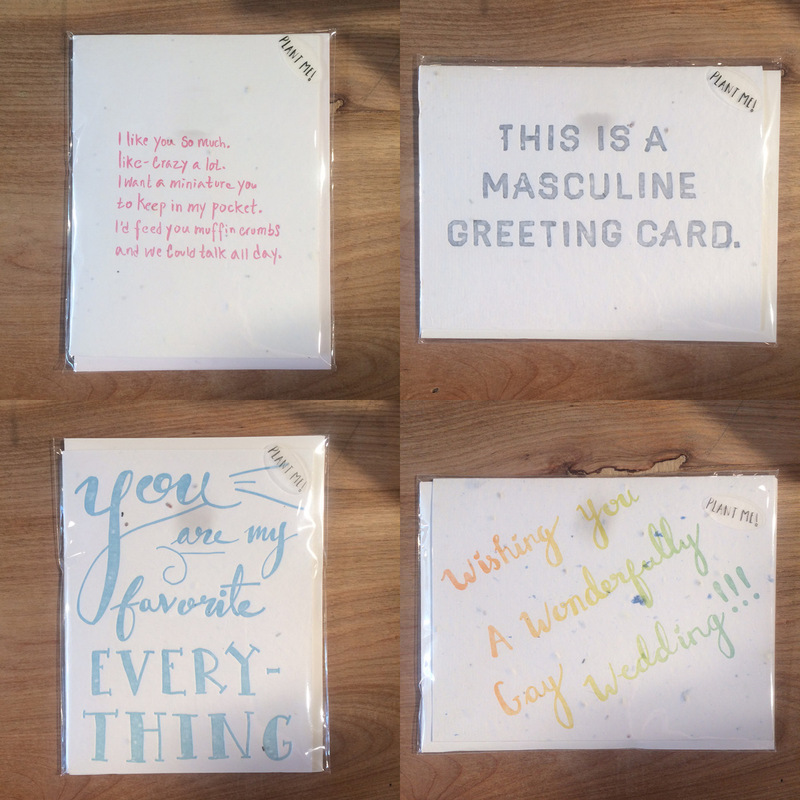 And they make cards, too! With seeds inside, of course. Rumor has it we’ll have more Tinker Coffee on the shelves tomorrow. Cottage Home Block Party: Saturday, October 15th, 5-11pm: We’ll be reppin’ Homespun goodies at this fun event! 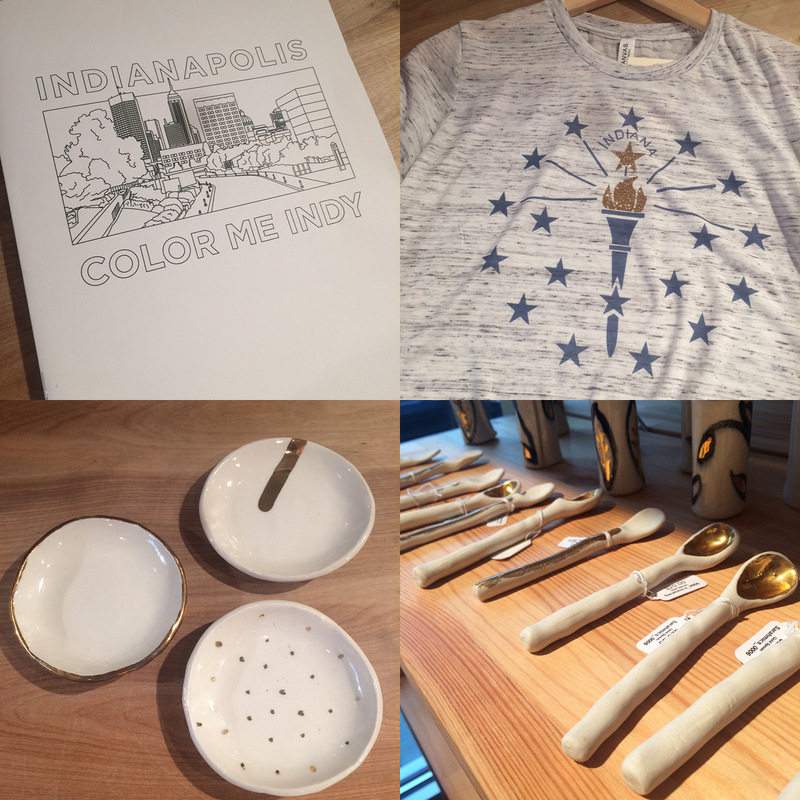 Come get yourself some delicious good and drink and shop, too. 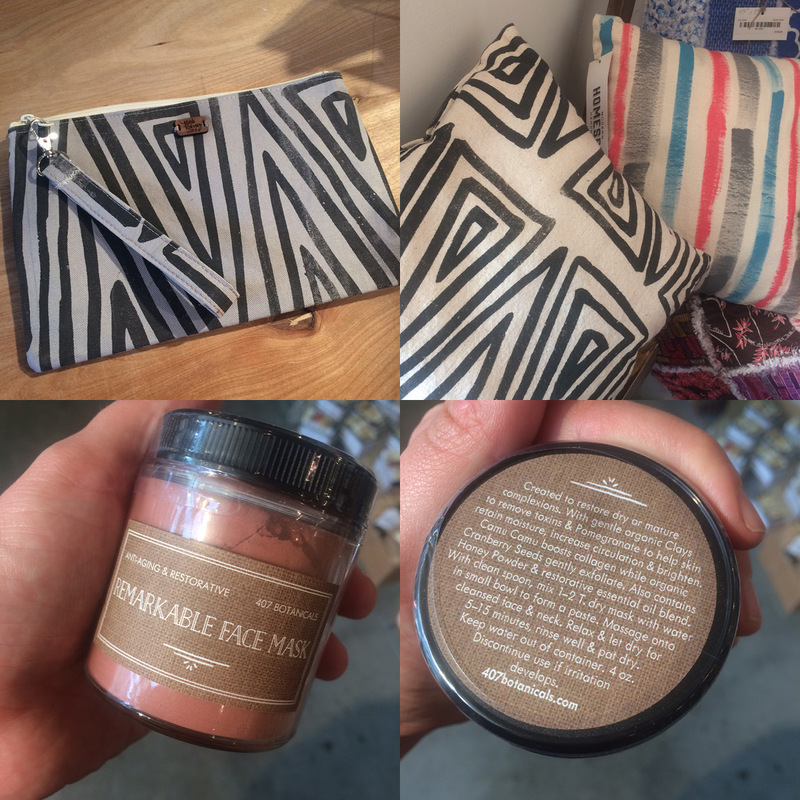 We’ve got a huge restock from Decorative Design Works to share with you this week and a few other lovelies as well. Be sure to peek our events list at the end of this post and join us for A Homespun Halloween this Friday! 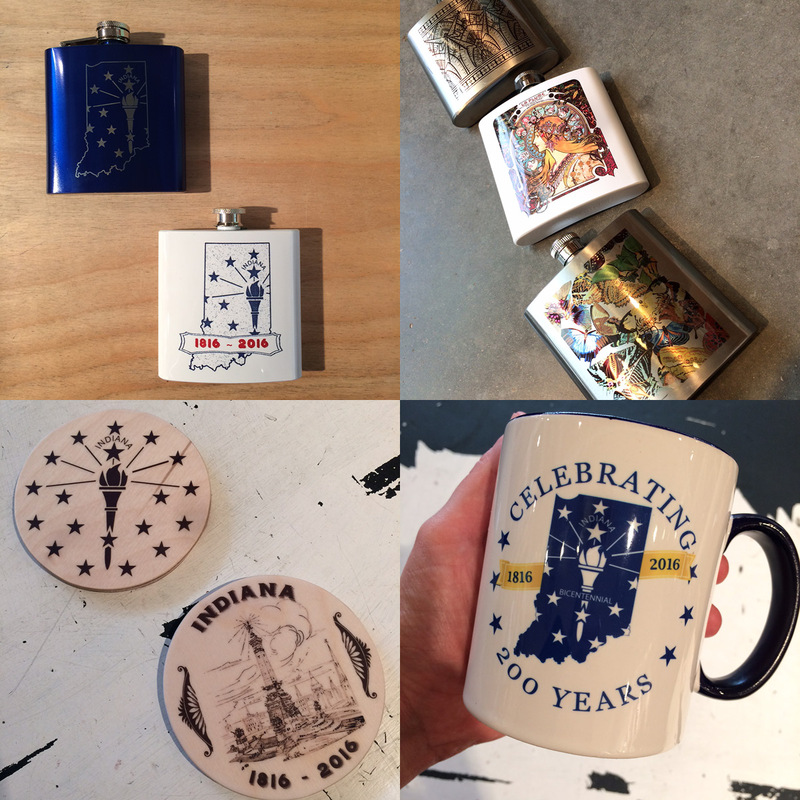 Flasks and coaters and t-shirts, oh my! 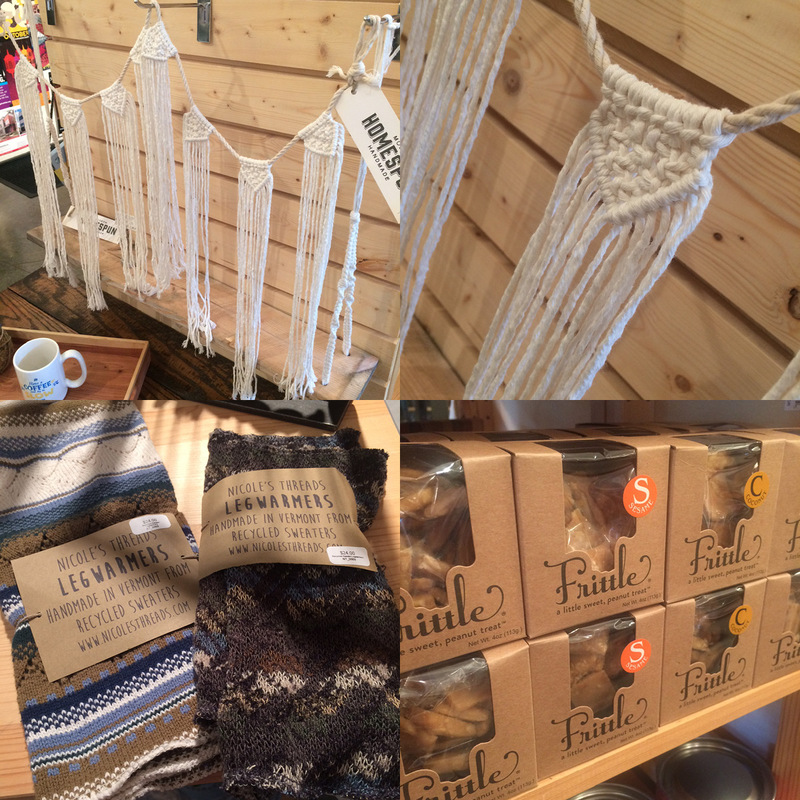 All these goodies and more on the floor now from Decorative Design Works. These beauties may not be completely new, but they jumped right off the shelves today in hopes of appearing on the blog, so I had to acquiesce. Brought to us by Haven Paperie. 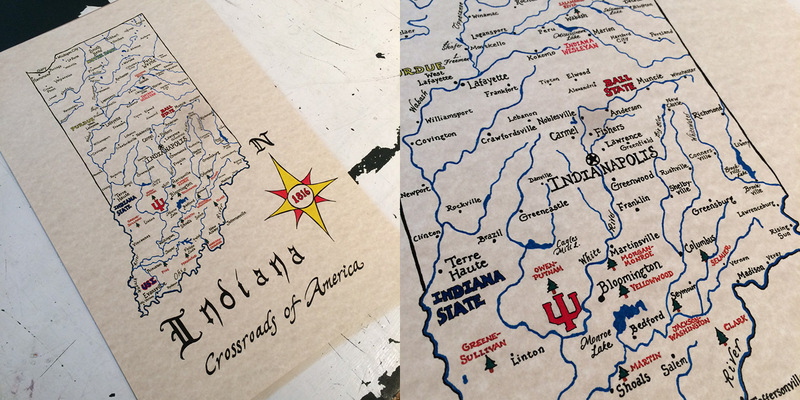 Intricately detailed with a historic aesthetic, this map of Indiana is marked with all the best spots. By Keep Indy Indie. 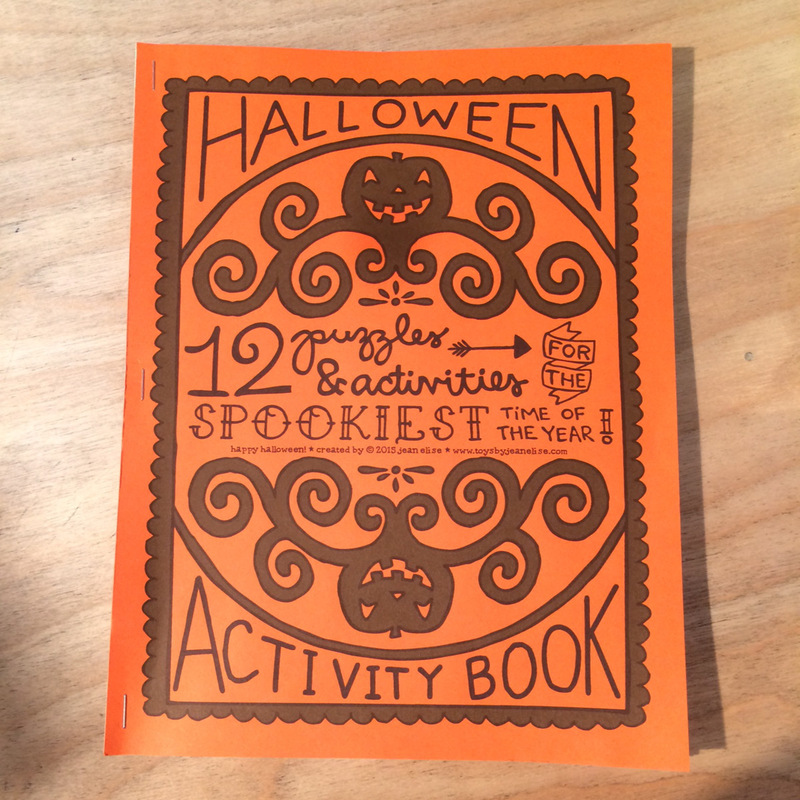 I’ll be sharing lots more Halloween goodies with you later this month, but I just couldn’t wait to share this awesome activity book by Jean Elise Toys. There are so many fun things for youngsters to do in here, I’m just about to buy one for myself. I love getting in the spirit! 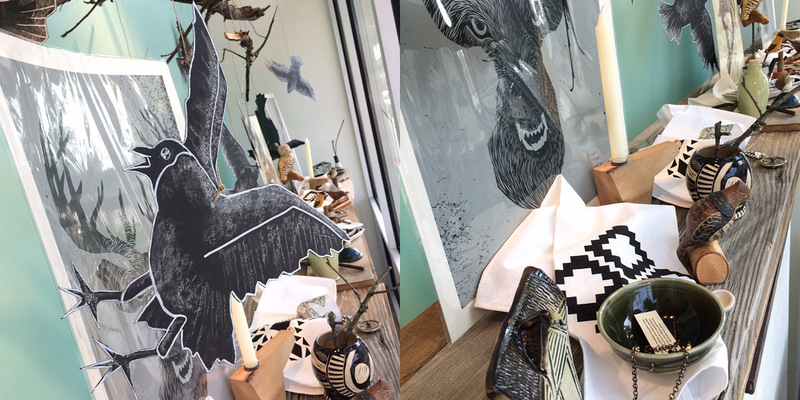 Our new raven themed display is spooky, creepy and totally handmade. Nice work, team. We look SO cute (duh) and so ready for fall (duh). 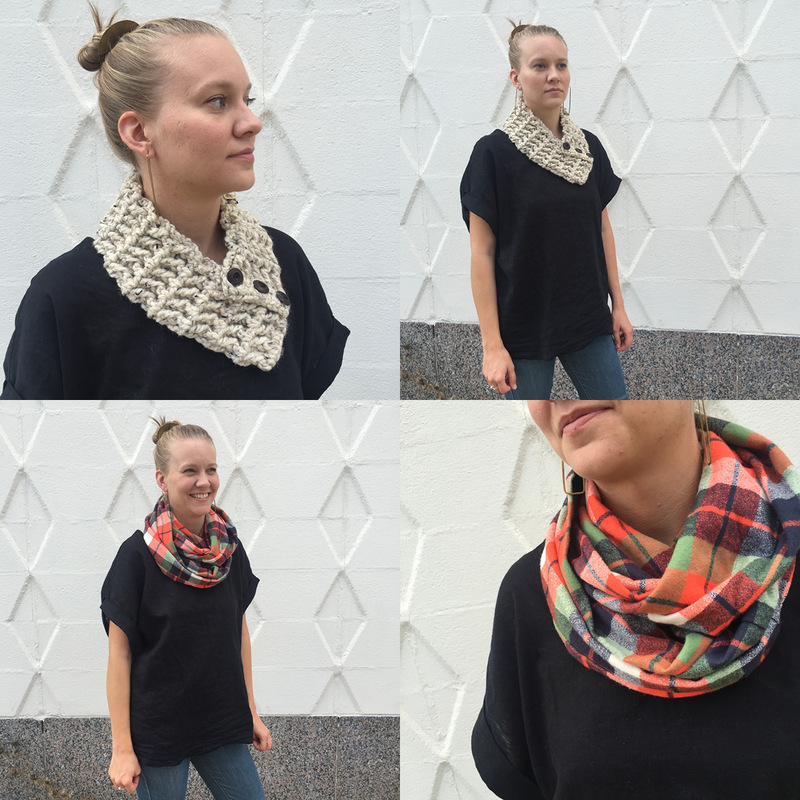 On the left we’re wearing a buffalo plaid cowl by Nicole’s Threads and long sleeve tee by Megan Lee Designs with a leather bag by LM Designs. On the right we’re wearing another Nicole’s Threads cowl, a fleece Cloque by Simple and Pretty and a gorgeous crescent necklace by Grey Theory Mill.